As urbanisation drives many to the cities and vehicle ownership increases, road users have to prepare themselves with the skills and attitude required to drive in heavy traffic much more often. Heavy traffic after delays caused by roadworks, road closures, road crashes. Environmental factors such as snow, mist, rockfalls and flooding causing road closures. Temporary closures caused by traffic and police enforcement. Increased travel during holidays, the festive season and Easter. Without the right attitude and driving techniques in these conditions, driving can become very dangerous. In this section, we will offer advice on how road users can be safer when driving in heavy and congested traffic. Even though not all instances of heavy traffic may be predictable, there are often advisories, alerts or signs that could point towards the conditions to be expected. Safe and defensive road behaviour start even before you get on the road. Driving in heavy traffic requires increased focus and attention, placing more strain on the body - a good rest before the drive would help prevent driving tiredness. Checking weather and road conditions in advance helps you plan a route and more awareness about what to expect along the way. Plan in advance -do not be the cause of your frustration and need to rush! Often leaving fifteen minutes before the start or after the end of peak hour can dramatically decrease the flow of traffic on your drive. Plan to avoid the worst holiday peak traffic periods when many highways become congested. Give yourself extra time to get to your destination and don’t set yourself unreasonable/unattainable targets for estimated time of arrival. Rather stop along the route to call people at the holiday destination and inform them of delays than taking risks to arrive at a specified time. Keep in mind that road crashes, road works etc. could add additional time as well as frustrations to your travel. Listen or browse for travel advisories on the radio and social media portals such as Twitter. Always be alert to possible alternative roads/routes to your destination. Some of the modern GPS devices have “live traffic” capabilities re-directing traffic away from heavily congested roads. 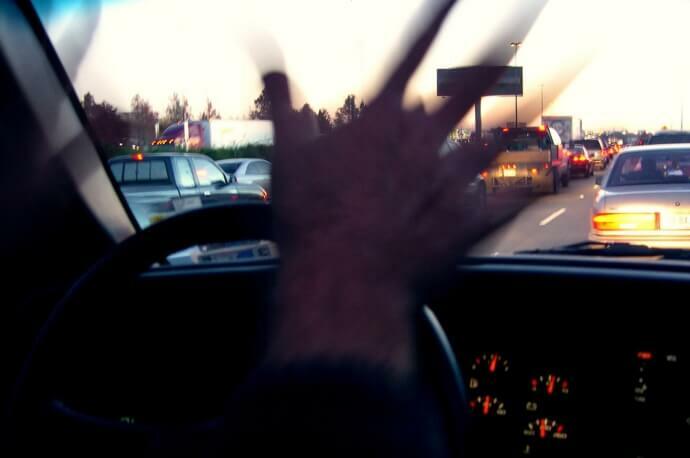 Driving in heavy traffic requires the correct mindset and some safe driving techniques. On the Arrive Alive website, we discuss Defensive Driving extensively. In this section, we would like to reflect on some of the aspects of special importance when driving on heavily congested roads. Defensive driving includes the skills and situational awareness needed to prevent dangerous situations on the road before these occur. Drive in a manner that will allow the time and space to respond swiftly to any emergency situation. Avoid aggressive driving and weaving from lane to lane - you are driving - not playing Tetris! Keep your eyes scanning traffic and road conditions. Adjust driving to the traffic, road and weather conditions. Identify hazards such as drivers and vehicles that appear unsafe, erratically merging across lanes, speeding dangerously, or drifting within a lane. Keep a close eye on the driving patterns of others, as well as road signs indicating detours, construction work or other obstacles in your way. Focusing on a general awareness of the traffic ahead of and behind you will help you build a mental picture of the driving conditions on your route. Keep left unless you are overtaking. Signal before making a turn or merging into a lane and be attentive to blind spots. Apply the brakes smoothly - By stopping and starting your car without jerky motions, you’ll avoid knocking into bumpers and help traffic flow along at a better place. Some drivers try to avoid holiday traffic congestion by driving at night. Be aware that nighttime driving may be three times more dangerous than driving during the day because of additional risk factors such as poor visibility, drunken pedestrians, animals on the road, tiredness and lack of concentration. Be alert in heavy traffic to the additional strain on the eyes caused by the lights from oncoming vehicles and the continuous "dim and bright" from headlights. Drive at a Safe speed - the speed limit may not be a safe speed, especially in heavy traffic. Be Proactive - Pay attention to heavy traffic in the distance. When approaching a crowded section of road, you should take your foot off the accelerator and coast forward, allowing friction to slow your vehicle. This will also reduce your speed while saving fuel. Weaving in and out of lanes trying to find the fastest-moving lane won’t save you much time and only increases the risk of road crashes. By slowing down, you can avoid potential collisions with jittery drivers who just don’t have the patience to deal with traffic delays. Follow the general flow of traffic - driving too slow can make other drivers around you impatient, agitated and lead to dangerous driving situations. During heavy traffic, keep a safe distance [buffer zone] from other vehicles and give yourself ample response time by slowing your speed. The following distance of 3 seconds would in most circumstances by a safe following distance. If you maintain a safe following distance you’ll have time to react to sudden braking by the cars ahead of you or any erratic driving you might encounter. Be attentive to traffic ahead of you - When cars in front brake, take your foot off the accelerator to slow down gradually before you brake. Be cautious not to brake abruptly. Cautious driving and a safe following distance will also help you avoid frequent braking and rear-end collisions. During the holidays you may encounter several slower vehicles towing trailers and caravans. Be extra cautious maintaining a safe following distance especially when driving in heavy winds. 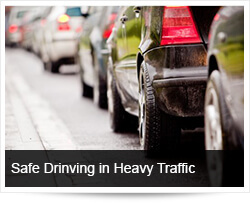 Driving in heavy traffic requires an increased focus and alertness. The road will be crowded with cars, the flow of traffic irregular, and people will start getting impatient, leading to them trying to merge where they likely shouldn’t. Keep both eyes on the road, both hands on the steering wheel and all your focus on driving. Ask your passengers to quiet down until you’re free of heavy traffic. Stay focused. Keep your mind on driving by avoiding distractions such as eating and drinking. Always remain vigilant and prepare yourself for emergency manoeuvres. Be extra cautious when heavy traffic is in areas of poor visibility and bad weather conditions. Impatient drivers can make poor decisions that might require you to take action to prevent an accident. Some drivers simply do not have the patience needed to avoid risky overtaking. Keep in mind that many drivers are driving during the holidays on unfamiliar roads. Holiday traffic is associated with increased stress from heat, traffic jams, noisy children and general tiredness. Sometimes you may need to take evasive measures and merge out of your lane and onto a shoulder. Keep your eyes scanning traffic, the shoulder of the road, and potential places you might direct your car in the event that you have to make emergency manoeuvres. Always have everyone buckled up on the front and back seat, however, short or slow the drive. In heavily congested traffic you are sharing the road with many different types of road users and vehicles. Be considerate, understanding and kind! Always communicate your driving Intentions. Indicators are the best tools to avoid agitation and road rage - Use them! Letting other drivers know what you’re about to do helps them prepare their own course of action, and reduces the risk of getting into trouble. You can also use your lights to flash and signal other drivers, warning them of potential problems, while increasing the visibility of your own vehicle. Check your mirrors continuously, scanning for possible dangers. In heavy traffic where vehicles are forced to drive at slow speed, bikers/motorcyclists see an opportunity to move ahead by lane splitting. Stay alert to the motorcyclist who may be passing by in the blind spot. Always give the right of way to fellow motorists, but be prepared to react to unexpected lane changes and turns. 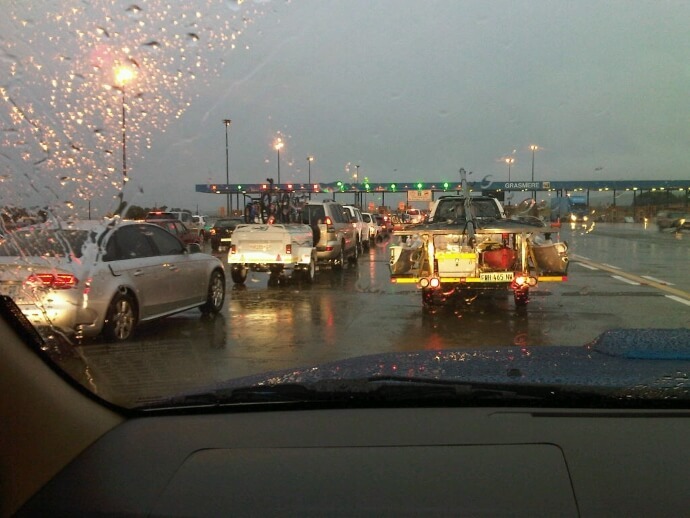 In heavy traffic, extra caution is required when experiencing bad weather. Keep in mind that this will further increase the braking distance required for vehicles - especially that of heavy trucks. Many horrific crashes in heavy traffic are head-on collisions caused by impatient drivers recklessly and unsafely overtaking. Before you overtake always consider - Is it legal? Is it safe? Is it necessary? Try to avoid dangerously overtaking multiple vehicles. Never assume that there will be a safe space for you to re-enter traffic once you have overtaken another vehicle [truck]. Remember that if you cannot see the mirror of the truck driver he also cannot see you. Use your mirrors to monitor the areas around your car. Perform head checks to check your blind spots before overtaking, changing lanes or merging. When passing, be sure to use your turn signals and check your blind spots, as well as in front of and behind your vehicle. You should be able to pass without getting too close to the car ahead or going over the speed limit; if you can’t, it may not be safe to pass. The risks of unsafe overtaking are increased in bad weather and with reduced visibility - the spray from heavy trucks on wet roads will make safe overtaking much more difficult! Acknowledge those drivers moving to the left to allow you more space for safe overtaking. To own a vehicle, to drive a vehicle and to be on the move are blessings. To go on holiday is an even bigger blessing. Keep this in mind as you go on the road. Let us be kind and courteous to our fellow road users and remember that road safety is a team activity - let us help each other to ease the frustrations of heavy traffic and help and allow everyone to arrive alive at their destinations!